China is a developing country with a huge population and also is at a crucial stage of reform. In this context, China still faces many challenges in economic and social development. And a lot still needs to be done in terms of human rights. In 2008, Newsweek named Hu the second most powerful person in the world referring to him as “the man behind the wheel of the world’s most supercharged economy.” Forbes also named him the second most powerful person in the world that year, but later (in 2010) they named him the World’s Most Powerful Person. Hu has been listed four times (2008, 2007, 2005 & 2004) on the Time 100 annual list of most influential people, though Newsweek once called him “cautious, colourless and corporate.” A Scientific Development Perspective leads, in Hu’s vision, to a “Socialist Harmonious Society” which creates a new “China Model” of governance that serves as a legitimate alternative to the West’s “Democracy Model” (particularly for developing countries). It is estimated that China has built over 500 new cities since 1978, and plans to complete hundreds more by 2020. This is a new model for urban development, one that has perhaps never been attempted before in human history on such an extreme scale. Rather than building up cities gradually and adding infrastructure and housing on an as-needed basis, China is building cities all at once in singular blasts of development. The biggest benefit of this strategy is that an entire city can be built on a single, fully integrated plan, but the risks are absolute: if the project fails, an entire city goes under. New cities are often new districts of existing municipalities built 15-30 miles further out with the space in between expected to fill, over time, with suburbs and smaller towns full of commerce. The cities are built from the ground up, including public works infrastructure, schools, government buildings, stores, malls, massive amounts of housing, universities, and sometimes even stadiums—all before a single resident moves in. IF they move in. Who loses when mistakes are made? All countries are imperfect, but still they imagine themselves able to make a difference, to make life better for their citizens, to do great things. And countries learn from each other. While China’s city-building efforts may not have been completely successful, the world has learned a lot from that gigantic effort. The wonder is that they did it so well. With little first-hand experience of building cities in locations inhospitable enough that they hadn’t already been developed (like mountaintops or deserts), it was inevitable that some mistakes would be made. Add to that the fact that growing interconnectedness makes mistakes of large, visible projects—and their likely reasons—be global blog fodder. Face can be lost. Added to the decision-makers’ burden is the knowledge that they’re constantly being judged and second-guessed around the world. Some cities may have prospered sooner (or prospered at all) had one thing or another been done only slightly differently. The sheer amount of wealth expended is enormous, and the net payoff remains to be seen. But the value of the information the undertaking is generating is inestimable, with each city a unique case study. One day will the archive of the collected data help a colony get up and running—and consequently survive—on some far-flung planet? Five generations of the Qiao family have called Maijieping, an isolated rural Chinese village in the central province of Henan, home. They came in the dying days of China’s Qing dynasty and looked on from their mountaintop perch as civil war, revolution, hunger, and finally massive economic change swept the nation. But now the Qiaos’ days in the family home are numbered as tens of thousands of Chinese villages are driven toward extinction amid what is being called the greatest human migration in history. Between 2010 and 2025, 300 million people—more than twice Russia’s current population—are expected to move to urban areas until, by 2034, 75% of the population are urbanised. Three decades of staggering economic growth and urbanisation have radically altered the face of Chinese society, condemning hundreds of thousands of rural communities, some of which have existed for hundreds of years, to the history books. More than 900,000 villages were abandoned or destroyed in the first decade of this century. Many of China’s vanishing villages have fallen victim to a frenzy of construction: swallowed up by rapidly expanding cities or knocked down to clear space for motorways, industrial estates or rail links. Chinese media recently published photographs of school children picking their way through rubble that was once Shaanxi province’s Mutazhai village after bulldozers knocked down their homes. Once home to thousands of residents, the village is to be replaced with a 2.9 million square foot “City Complex” boasting hotels, shops and a tower 1,148 feet tall. The country is undergoing the largest urbanisation in history. Throngs of migrants from the countryside all need homes the argument runs (though it’s never spelled out exactly how they’ll afford them). China’s swelling middle classes, many of whom live in shoddy older homes, are eagerly moving to fancier flats, even McMansions. The result has been a spectacular property boom over the past decade. For clarification: The hukou is a residency permit or household registration. A person’s hukou is usually registered soon after birth, based on the mother’s residential status. A hukou is necessary to receive social benefits, and for the individual to apply for documents such as ID cards and passports. Before the 1980s, the hukou system restricted people’s ability to move to another city, get married, change jobs or even get housing. Although this is no longer the case, migrants who want to live away from the place of their hukou still face extreme difficulties getting their children into school and obtaining medical care and other social benefits. Critics argue that the hukou system is both unfair and unsuited to an economy that is powered by migrant workers and graduates who move away from home to start their careers. In 2003, a young migrant graphic designer was beaten to death in a police-operated repatriation station, where migrants without proper documentation are processed back to the area of residence specified on their hukou documents. The incident led to a vigorous debate about whether China should abandon the hukou system entirely. There’s since been loosening of controls (some), but with “stability maintenance” a top priority of the government in recent times, it’s unlikely the hukou will be abolished in the near future. A bus passes along a highway in front of residential housing in Hong Kong, 2010. A son cries after his mother jumps off a building and dies at the demolition site of her Yangji village in Guangzhou, Guangdong province May 2012. Flawed financial incentives for cities and developers, along with the poor phasing of services and amenities (the lack of hospitals, schools, taxis, cable television, high-speed Internet services and entertainment facilities) as well as few jobs have put people off from joining these brand new communities and creating most of the problems which occur. In addition, China’s emerging middle class invests in real estate, because it’s seen to be more secure than the stock market. People buy apartments in incomplete communities but don’t move in—they plan to hold it through a constant value rise, then sell. Or they may plan to retire there. The result can be a string of large, empty developments that remain speculative investments rather than real homes and communities. Spiralling maintenance costs see them at constant risk of falling into disrepair. Once construction on a new city is “finished,” everything will look nice—beautiful–on the outside, but some of the houses or apartments will be shoddily constructed and in need of repair fairly soon, and all of them will be unfinished on the inside—nothing but concrete floors and plaster walls. The home buyer will therefore need to spend as much as he paid for the house—or more—in order to get it repaired and liveable. This is an important aspect for the speculator because he’ll of course have people in the construction industry he owes favours to, and may even be into the home-remodelling business himself. Now the speculator waits. Will anyone buy his houses or apartments? This is a gamble. If they’re bought, it may be by people who’ve saved for years for the required 1/3 down. Or perhaps they’ll be bought by lower-tiered speculators who’ll pick up 3 or 4 houses or apartments on credit and hold them, betting the price rises. Sometimes there’s too few of the former and too many of the latter for the city to survive. Depending upon the location of the development, the real estate market, and the quality and price of the homes and apartments being sold, the complex may end up fully sold and occupied, or fully sold but to speculators who have no intention of living there, ever, or of selling anytime soon. Of course, it could be that sales are slow to non-existent, because no one has the money or the desire to buy the property for any reason. And they never will. Jing Jin is one of China’s many recently developed eco cities. Despite developers’ attempts to entice residents of neighbouring mining towns with promises of new educational facilities and a scientific research centre, the 104 square kilometres sits abandoned and unused. It is rumoured that more than 64 million newly-constructed apartments across China are currently empty. Nevertheless, by the government’s count, 144 cities in 12 provinces are planning 200 new towns. Housing completions rose to 1.1 billion square metres last year. New homes are often not being purchased by individuals but by local governments, banks and state-owned enterprises. How many of these are ultimately owned by ordinary citizens (and at what cut-rate price) is unknown. Property developers have taken on massive quantities of debt. Some analysts think the industry is at its most indebted for a decade. That makes it vulnerable to a downturn. If the economy hits a rough patch and sales slow, the most desperate owners could start a vicious cycle of price cuts. The bubble could take as much as 5 years to completely burst, with prices dropping by an estimated 40% from current levels. But markets in smaller cities have been known to burst without puncturing the national economy. This is what everyone hopes for. Ordos is one of the 12 major subdivisions of Inner Mongolia, People’s Republic of China. It is located within the Ordos Loop of the Yellow River. Although mainly rural, Ordos is administered as a prefecture-level city. The administrative seat is at Dongsheng. The square is vast, fading into the snowy mist on a recent Sunday morning. 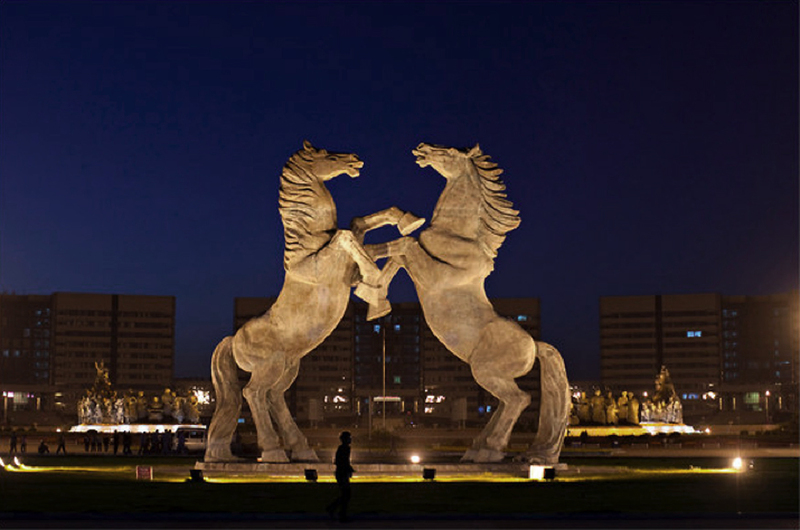 Genghis Khan Plaza is flanked by huge and imposing buildings. There is indeed a whole herd of these things in the New Area town square. Impressive, really, built as a tribute to Genghis Khan whose unmarked tomb is claimed to be “nearby”. On the vast square, towering bronze sculptures honour the Mongolian warrior Genghis Khan. The story started about 20 years ago, with the beginning of a great Mongolian coal rush. Private mining companies poured into the green Inner Mongolian steppe lands, leaving a landscape pockmarked with enormous opencast holes, or tunnels underground. Local farmers had sold their land to the miners, and became instantly rich. Jobs burgeoned. Ceaseless coal truck convoys tore up roads. But the old city of Ordos flourished as the money flowed in. The municipality decided to think big, too. It laid out plans for a huge new town (Kangbashi New Area) for hundreds of thousands of residents, with Genghis Khan Plaza at the centre of it. The Kangbashi New Area had been administered as an area called the Ih Ju League since the 17th century. It was redesignated a prefecture-level city and renamed Ordos on 26 February 2001. “Ordos” means “palaces” in the Mongolian language; the name is sometimes claimed to be related to the 8 white yurts of Genghis Khan. In 2003, Ordos city officials launched the creation of a new 1-million-person city district. Located on 355 square kilometres (137 square miles), the site is located 25 kilometres (16 miles) from the existing city of Dongsheng. The New Area is located near existing water reservoirs (on the site of what had recently been two local villages). As of 2010, the government had invested around 1.1 trillion yuan ($161 billion) in development and the city was complete enough to host the 2012 Miss World Final. Construction projects continue despite the lack of occupancy. Though many of the properties in Ordos / Kangbashi New Area have been sold and at least a million people were projected to be living in there by 2010, the city is still essentially empty. Intended to have 300,000 residents by 2010, government figures stated it had 28,000 (that’s 469 people per square mile, less than 5% of the average for small Chinese cities). Of these, more than 11,000 were city government employees (who, it was said, were allowed to buy their homes at a discount of 50% or more). There are 10,000 migrant labourers who are de facto residents. The rest are executives in the coal and construction industries, some of whom bought several houses at a time, and some don’t actually live in any of them. Many workers continue to commute from the old town because of the lack of stores, restaurants, and amenities (such as laundries) in the new area. (There are more street cleaners than pedestrians on most sidewalks.) There are no direct rail lines to the city, but there’s an airport. Most workers don’t have cars. Known for its lavish government projects, Ordos City has substantial infrastructure which is seldom used by residents, but it’s rumoured that these additions helped the regional government meet their annual GDP target. The Ordos area is rich in natural resources, having 1/6 of the national coal reserves and 1/3 of China’s natural gas reserves. The pillars of the region’s economy are textile (wool), coal mining, petrochemicals, electricity generation and production of building materials. As of 2010, fewer than 2 million people, mainly Han, lived in the whole area. Media reports criticise a “general obsession with GDP”, which they claim prompts governments to use taxpayers’ money to build empty commercial and residential developments. Investment in infrastructure accounts for much of China’s GDP—the country is said to have built the equivalent of Rome every 2 months in the past decade. And with such a large pool of labour, it’s harder to put the brakes on when growth slows and supply outstrips demand. There are 7-8 million people entering the workforce in China every year; they need something to do. Authorities in Beijing have taken notice of the direst warnings, taking official action to rein in speculative buying of multiple apartments over the past two years. Chinese economic commentators seem little concerned. They’re still confident that the technocrats in Beijing who’ve guided China’s 30 years of spectacular economic growth will soon be able to balance supply and demand in the housing market. Are many of these speculative white elephant or an astonishing manifestation of what the Chinese combination of enterprise and state planning can achieve? Despite the recent controversy, however, the Ordos government still has plans to expand Kangbashi in the future—to 355 square kilometres, or 10 times its current area. Analysts estimate there could be as many as a dozen other Chinese cities just like Ordos, with sprawling ghost town annexes. This University Hides 170,000 Students? Chenggong (which means to “submit tribute”) city District, on the east bank of the Dian Lake, is a nearly 41-square-mile area under the jurisdiction of Kunming, Yunnan, China. It is the chief zone for the expansion of the city of Kunming, almost a 20-minute drive away, and the site of the new Kunming City Hall and new campuses for Yunnan University, Yunnan Normal University, and 13 other universities. As of 2012, much of the newly constructed housing is still unoccupied and Chenggong is reportedly one of the largest ghost towns in Asia (similar to the situations in Ordos City and the New South China Mall). There are more than 100,000 new apartments with no occupants. However, some commentators expect it to become occupied over the next few years, as central Kunming is overcrowded. Some Government departments have moved to Chenggong and a light rail link from there to Kunming is under construction. Kunming (whose city slogan is “Every day is Spring”) has a population of 6.5 million people. Designed as Kunming’s overspill point, Chenggong began to take shape in 2003. High-rise apartment blocks mushroomed. But today, it remains largely deserted. The suburbs and even the city centre are empty—despite this freshly minted city boasting the growing Yunnan University, currently with 170,000 students and faculty. The new town plans for 1.5 million people, but there are still scores of vacant buildings. Why? Foremost is Chinese tax policy: there are no local property taxes so cities derive most of their income from developing land. The incentive is to lease large tracts, even if the market and complementary services aren’t ready. Without an ongoing property tax, the long-term viability of the towns is a secondary consideration. Compounding this, the average Chinese worker, with his high savings rate, needs some option for investment. Lacking a transparent stock market, most workers prefer owning real estate if they can, both as an investment and as a future home for their child (of which they likely have only one). Buyers often pay cash—with no debt and no property tax, it’s easy to hold an empty apartment. Additionally, the country has yet to see a drop in real estate values so the properties seem safe. Plus, transit in Chenggong isn’t complete and many of the town’s services and schools are yet to come. So, many purchase an apartment but stay in their old homes until the new community has matured a bit or until their child marries. However, the economics of owning vacant property as an investment are changing. Most development in China takes the form of superblocks with towers in the park-style gated communities. With up to a quarter of a mile to an intersection and often 8 lanes of automobile traffic to cross the street, walking and biking in these districts is difficult and dangerous. Driving then skyrockets worsening congestion, air pollution, carbon emissions, and household costs. In Jinan, a study showed a quadrupling of auto travel in the newer superblock developments. In addition to these growing economic and environmental issues, these developments—some containing more than 5,000 dwellings—hold the seeds of rapid social decay. This urban pattern isolates people in huge impersonal landscapes that lack identity, safety (no “eyes on the street”), community, and a human scale. The West demolished a generation of social housing built on this model; perhaps the Chinese may someday do the same. Fortunately, Chenggong is experimenting with a new model of urban planning. With support from the national government and planning by the China Sustainable Transportation Center, 2,500 acres in the central district of the new Chenggong is being redesigned. The superblocks have been broken down to human-scale, traditional courtyard blocks. The streets are smaller and more frequent—and many are auto free or dedicated for transit. Parks are smaller but closer and safer, with housing overlooking each. Mixed-use buildings with sidewalk-oriented shops and cafes should help to rebuild the street-life that was once a hallmark of older Chinese communities. Then, jobs will ultimately balance with housing, avoiding the “bedroom community” syndrome that has eroded suburbs over the world. Or so the plan goes. A network of car-free streets, some with bus access, others for bikes and pedestrians, spaced no more than 800 metres apart throughout the town. Linear greenways, neighbourhood parks and larger community parks located throughout, easily reached by car-free streets and/or quiet local roads. Through-traffic carried on streets no wider than 45 metres with higher-volume traffic diverted onto pairs of one-way streets no more than 30 metres wide allows safe pedestrian crossing. Areas with high levels of transit service, such as crossings of metro or rail lines are higher density with more commercial development and greater use mix. Dozens of new developments in Jiangsu with nary a car in sight. Brand new, empty houses in still another empty development. A worker walks down a road between houses under construction in Huaxi village, in Jiangsu province, October 2011. Jiangsu is an eastern coastal province of the People’s Republic of China. The name comes from jiang, short for the city of Jiangning (now Nanjing), and su, for the city of Suzhou. It is the province with the highest population density in China, though the provincial-level municipalities of Shanghai, Beijing, and Tianjin have a higher density. It borders Shandong in the north, Anhui to the west, and Zhejiang and Shanghai to the south. Jiangsu has a coastline of over 1,000 kilometres (620 miles) along the Yellow Sea, and the Yangtze River passes through the southern part of the province. Since the initiation of economic reforms in 1990, Jiangsu has been a hot spot for economic development, and now has the highest GDP per capita of all Chinese provinces. There’s been a huge amount of construction in Jiangsu province, but I see nothing that indicates that the finished homes and offices sit around empty and unused forever—or even for long. This appears to be one of China’s successes. That Huaxi, for one, is prosperous seems undeniable. Villagers get lavish annual stipends, live in spacious single-family homes instead of China’s usual cramped apartments, drive imported cars, and get basic medical care, education and even an annual vacation free from the government. Lately they also get free helicopter rides, courtesy of a fleet of helicopters and small jets the village is buying to attract still more sightseers because Huaxi, along with most of the rest of the country, grapples with slowing growth, slumping exports, industrial overcapacity and growing debt. Maybe tourists will fix things. The distinction of being the world’s biggest ghost mall, or emptiest shopping centre, may belong to this vast complex on the outskirts of Dongguang, a city of 10 million. You may think the mall would be booming, with a population of that size, but the vast majority of its 1,500 stores have been empty since it was finished in 2005. It’s been hurt by poor transport infrastructure. As one blogger puts it, “Unfortunately it was built in the middle of nowhere.” A solitary toyshop owner waits days at a time to sell a toy. It isn’t as though developers haven’t tried. They threw in a canal, windmills, a replica of the Campanile from St Mark’s Square in Venice, and a replica of the Arc de Triomphe in Paris. The mall’s website says it’s “bound to be a miracle of commercial history.” A Netherlands-based blogger says, “It’s a building where you can see that there was some activity earlier—though very little—but it’s like a ghost town. The very few shops are deserted of customers. The promotional posters mostly depict happy Caucasian children.” According to its untended website, its 7 districts are: San Francisco, Rain Forest, Caribbean Sea, Amsterdam, California, Champs Elysées, and Venice. A blog from a mall visitor leaves off San Francisco and the Rain Forest and adds Egypt and Rome (maybe they’re trying new things). Most of the deserted sections are blocked off from the public because pieces of plaster are peeling from the walls, pipes are rusting, great façades breaking apart, empty sections gently falling into ruin. Roughly 4 million people live within 6 miles of the mall, 9 million within 12 miles, and 40 million within 60 miles. But for some reason it seems far away from just about everyone as it’s not connected via efficient transportation corridors and yet it’s too far for most people to walk or ride a bike. Most residents even of Dongguan would need to take multiple city buses to get to there, let alone visitors from Guangzhou or Shenzhen. Getting to this place is a drawn-out affair of wading through a glutinous masses of traffic. Who wants to do this? Close to the mall are mostly factories and factory workers—not their target clientele. And no one foresaw this? There’s a high street of shops, with names like “Mike’s Records” and “The Fish Bar”, all of them empty shells. There are cobbles, wooden beams, double yellow lines on the streets, telephone boxes, and street after street of nothing. It’s not just deserted—in fact, it was never used. Even their website hasn’t been updated since the month it opened in 2006. Supposedly all properties were snapped up as investments, now they’re quietly trying to sell them. Posters with telephone numbers are stuck in apartment windows around town. Across from the church is what looks like an arcade of shops but walk through an open fire escape and it’s like The Truman Show. Only a couple of places, including this pub, have actually stuck it out. They’ve got a menu written only in Chinese and don’t serve English food. As one visitor put it: “This place looks more like a medical research facility where they run experiments on lab rats and monkeys than anything resembling Italy—no wonder the place was deserted.” Officially, it’s called Breeza Citta di Pujiang. The development is part of Shanghai’s One City, Nine Towns initiative, which now has British, Dutch, German, American, Spanish, Swedish, French, and Italian themed districts. The only restaurant in the town is this (vacant) Italian bistro. Anting German Town sits like a foreign country that was plopped down in the middle of a manufacturing / industrial wasteland on the northeastern fringe of Shanghai. Anting’s neighbouring district is called Automobile City. There is a Volkswagen plant, a slew of car components factories, and a Formula One race track. But now the world’s most populated city is steadily encroaching. The official take is that only 1 out of every 5 homes is occupied, but the view on the ground gives the impression that this number may actually be lower. The German bar doesn’t open until 4pm. The Chinese are known for their mastery at making knock-off handbags, apparel, electronics, watches, you name it—but Halsatt is a knock-off town. Although this is the first replica village to be created, Hallstatt the Second represents a broader movement of housing developments created in the rural peripheries of big cities for the urban rich looking for a place to take refuge. There is a growing demand in China for nature-conscious, green, less-polluted, healthier environs. Hallstatt is the model to which this movement aspires. More photos here. Photographers who visit this imitation English town generally come not to capture decay but newlyweds posing in front of mock-Tudor buildings and red phone boxes. The Shanghai suburb boasts a market square, a castle, a neo-gothic church, cobbled streets, a pub, a chip shop, Georgian-style houses and statues of well-known English figures, such as Winston Churchill, James Bond and Harry Potter. As a backdrop, it’s a hit with the wedding industry, but that is about it. Another mock English town is being planned near Beijing. “Four miles of polluted rivers running through 1,000 acres of blighted semi-rural land will be restored and landscaped into scenic standards becoming of the English countryside,” a Chinese official said. Why d’you suppose they spent this much on beauty but didn’t bury their utilities, leaving them to be unsightly overhead? The lack of people is mostly attributed to another out-of-the-way location—surrounded mostly by farmland and dead-end roads snaking through countryside. It’s a pretty impressive clone, though—the 354-foot Eiffel Tower replica looks fairly realistic, but it’s only 1/3 the size of its French counterpart. (By comparison, the Las Vegas replica is half-scale at 541 feet.) Estimates of the current population at Tianducheng are placed at around 2,000 people, many of whom are employed at a nearby French-themed amusement park. More photos here. It isn’t often that one gets to build the bridge before creating the body of water it’s intended to span. From the look of things, construction has a long way to go. The soil is parched and saline. The unfinished Disneyesque castle and medieval ramparts of this theme park north of Beijing, conceived nearly 20 years ago, lie abandoned. Construction work, which was promoted by developers as “the largest amusement park in Asia”, stopped around 1998 after funds were withdrawn due to disagreements over property prices with the local government and farmers. Now, local farmers grow crops among the empty buildings. The site does in fact attract visitors, according to locals quoted by Chinese media, but hardly the sort the developers had in mind—drawing students, photographers and artists from Beijing, apparently, in search of a “ruin culture”. Erenhot is a city located in the Gobi Desert, in the Xilin Gol league of the Inner Mongolia Autonomous Region. The area around the town, especially a salt lake known to paleontologists as Iren dabasu or Iren nor (Mongolian for colourful salt lake) to the east, is known for the discovery of a number of different dinosaurs. Called the “Dinosaur City,” fossils discovered in the area include the biggest and best-preserved dinosaur fossil in Asia. From the southern dinosaur-kissing city gate to the northern region of Erenhot, a total of 48 dinosaur statues have been installed parallel to the main boulevard. According to the China News Service, the city is applying for entry into the Guinness World Records regarding its dinosaur statues and scenic boulevard. The city houses a dinosaur museum, and in 2006 a big arch in form of two Sauropoda was built on the highway southward. In 2007, a number of smaller figures of different species were added. Over the past decade, scores of empty strip malls and apartment buildings have sprouted from the sand—an eerie skyline visible for miles across the flatlands. At dusk, construction workers headed home on bikes and mopeds are sometimes just about the only traffic on the wide, freshly paved streets, illuminated by shiny new lampposts. There is a certain desolate beauty in the barren, windswept desert steppe that surrounds Erenhot. But the empty strip malls with their storefronts all bearing the same surreal sign—“Careful!“—and the uninhabited buildings looming grey and solitary make the place feel as alien as a video-game backdrop. It looks to outsiders as though the great Chinese building boom is over, the real estate extravaganza that shook the world. Western financial experts who fear a bursting of the Chinese real estate bubble point out that the Chinese economy is more dependent on house building than the US economy was, before the sub-prime lending bubble burst in 2007. Many Chinese local authorities seem to have become dependent on the proceeds of big land sales to developers. In the eyes of the critics, China’s housing boom is becoming a disaster. But real estate purchases are different in China: Chinese apartments are typically sold as concrete shells that buyers must outfit, installing everything from showers to flooring to kitchen sinks to make them move-in ready. So when buildings are first “completed,” they’re actually not habitable; it takes a long time before most people want to move in. Many “ghost” developments take a while to gain traction—especially as it’s often the sale of the land they sit on that allows the city to fund subsequent facilities and transportation links that slowly help them become mature neighbourhoods. With rural-to-urban migration averaging 15 to 20 million people per year, today’s so-called ghost cities can quickly become tomorrow’s thriving metropolitan areas (assuming they stay relatively well maintained). Shanghai and Shenzhen recently followed Beijing’s lead by requiring that buyers of second homes put up 70% of the purchase price as a deposit. In Beijing, the sale of a second home incurs a 20% capital-gains tax. (This is supposedly a nationwide policy, but is not always enforced in other cities.) Couples with two homes are reportedly divorcing to avoid the tax, since once officially single, they can each own a primary residence and thus sell either one without penalty. Shanghai’s Pudong is the classic example of how an “empty” urban construction project in the late 1990’s quickly became a fully occupied urban centre, with a population today of roughly 5.5 million. A McKinsey study estimates that by 2025 China will have more than 220 cities with populations in excess of one million, versus 125 in 2010, and that 23 mega-cities will have a population of at least 5 million. China can’t afford to wait to build new cities. Instead, investment and construction must be aligned with the future influx of urban dwellers. There is much more to this story, which I will continue in a future post. http://blogs.forrester.com/jennifer_belissent/10-03-15-tale_two_cities_two_approaches_making_cities_smarter_part_iii “A Tale of Two Cities: Two Approaches to Making Cities Smarter, Part III” by Jennifer Belissent, PhD, Forrester Blogs, 15 March 2010.
http://en.wikipedia.org/wiki/Chenggong_County Chenggong District from Wikipedia. http://www.bbc.co.uk/blogs/thereporters/robertpeston/2010/11/china_boom_or_bust_1.html “China: boom or bust?” by Robert Peston, BBC Blogs, 5 November 2010.
http://www.economywatch.com/economy-business-and-finance-news/China-housing-inequality-13-01.html “China Housing Inequality: Ordos – Wealthy Mongolian Ghost Town” by David Caploe, Economy Watch, 13 January 2011.
http://www.sbs.com.au/dateline/story/related/aid/759/id/601729/n/China-s-Empty-Cities “China’s Empty Cities” by Adrian Brown, Dateline, 15 August 2012.
http://blogs.wsj.com/chinarealtime/2013/09/24/chinas-ghost-cities-may-not-be-so-spooky/ “China’s 'Ghost Cities’ May Not Be So Spooky” from ChinaRealTime, the Wall Street Journal, 24 September 2013.
http://www.motherjones.com/politics/2010/04/china-ghost-mall “China’s Potemkin Cities” by April Rabkin, Mother Jones, 18 August 2010.
http://www.bbc.co.uk/news/magazine-19049254 “China’s ghost towns and phantom malls” by Robin Banerji & Patrick Jackson, BBC News Magazine, 13 August 2012.
http://www.telegraph.co.uk/news/worldnews/asia/china/10470077/Chinas-villages-vanish-amid-rush-for-the-cities.html “China’s villages vanish amid rush for the cities” by Tom Phillips, The Telegraph, 23 November 2013.
http://www.nytimes.com/2010/10/20/business/global/20ghost.html?pagewanted=all “Chinese City Has Many Buildings, but Few People” by David Barboza (research contributed by Bao Beibei), The New York Times, 19 October 2010.
http://www.ft.com/intl/cms/s/0/cd356b12-d129-11e2-a3ea-00144feab7de.html#axzz2lqXZqF1O “Chinese Economy: Out of Proportion” by Jamil Anderlini, Financial Times, 9 June 2-13.
http://www.chinadaily.com.cn/cndy/2010-06/10/content_9958768.htm “Ghost Town” by Hu Yinan, China Daily, 10 June 2010.
http://www.economist.com/news/finance-and-economics/21589877-even-big-developers-and-state-owned-newspapers-are-beginning-express-fears “Haunted Housing” from The Economist, Shanghai, 16 November 2013.
http://www.archdaily.com/425651/ “How to Bring China’s Ghost Towns Back to Life” by Peter Calthorpe, Arch Daily, 6 September 2013.
http://en.wikipedia.org/wiki/Hu_Jintao Hu Jintao from Wikipedia. http://www.shanghaifocus.com/blog/wuxi-travel/huaxi-wealth-village-in-wuxi “Huaxi: Wealth Village in Wuxi” from Shanghai Focus, 26 October 2011.
http://en.wikipedia.org/wiki/Kangbashi_New_Area Kangbashi New Area from Wikipedia. http://en.wikipedia.org/wiki/Mausoleum_of_Genghis_Khan Mausoleum of Genghis Khan from Wikipedia. http://thechinachronicle.com/new-south-china-mall-the-worlds-largest-mall-is-still-99-deserted/ “New South China Mall: An Update On The World’s Largest (Ghost) Mall” by Wade Shepard, The China Chronicle, 6 January 2013.
http://thechinachronicle.com/china-ghost-city-dantu/ “Not Deserted! This Chinese Ghost City Is Peopled” by Wade Shepard, China Chronicle, 9 March 2013.
http://en.wikipedia.org/wiki/Ordos_City Ordos City from Wikipedia. http://blogs.worldbank.org/transport/rise-of-the-chinese-ghost-town “Rise of the Chinese Ghost Town” by Holly Krambeck, WorldBankBlogs, 12 July 2010.
http://www.businessinsider.com.au/china-ghost-cities-2011-11#chinas-most-famous-ghost-city-on-the-outskirts-of-ordos-has-been-empty-for-years-1 “Satellite Pictures Of The Empty Chinese Cities Where Home Prices Are Crashing” by Gus Lubin, Business Insider Australia, 11 December 2011.
http://en.wikipedia.org/wiki/Sino-Singapore_Tianjin_Eco-city Sino-Singapore Tianjin Eco-city from Wikipedia. http://en.wikipedia.org/wiki/Sky_City_ Sky City (Changsa) from Wikipedia. http://www.thechinastory.org/yearbooks/yearbook-2012/chapter-2-symbolic-cities-and-the-cake-debate/ “Symbolic Cities and the 'Cake Debate’” by Carolyn Cartier and Luigi Tomba, from The China Story Yearbook 2012: Chapter 2.
http://www.foreignpolicy.com/articles/2013/06/21/photos_ghost_city_chenggong_china?page=full “The Empty City” by Matthew Niederhauser, Foreign Policy, 21 June 2013.
http://business.financialpost.com/2012/08/29/what-china-doubters-have-wrong-about-its-ghost-cities-stephen-roach/ “What 'China doubters’ have wrong about its ghost cities: Stephen Roach” by Mamta Badkar, Business Insider, 29 August 2012. Air race pilots in a tight pylon turn experience high G-forces, but the important thing to remember is that any aircraft operated in a maximum-performance profile will subject the pilot to acceleration that is greater than the 1 G acceleration encountered on the ground. The low pressure over the wings has cooled the air below its dew point, causing the humidity to condense into visible water droplets in just the right place in the sky for sunlight to refract through the water droplets toward the camera lens. I was once on a US military ship, having breakfast in the wardroom (officers lounge) when the Operations Officer (OPS) walked in. This guy was the definition of NOT a morning person; he was still half asleep, bleary eyed, basically a zombie with a bagel. He sat down across from me to eat his bagel and was just barely conscious. My back was to the outboard side of the ship, and the morning sun was blazing in one of the portholes, putting a big bright circle of light right on his barely conscious face. He was squinting and chewing and basically just remembering how to be alive for today. It was painful to watch. But then zombie-OPS stopped chewing, slowly picked up the phone, and dialed the bridge. In his well-known I’m-still-totally-asleep voice, he said, “Hey, it’s OPS. Could you shift our barpat… Yeah, one six five. Thanks.” And he put the phone down. And then he just sat there. Squinting. Waiting. Ever so slowly, I realised that that big blazing spot of sun had begun to slide off the zombie’s face and onto the wall behind him. After a moment it cleared his face and he blinked slowly a few times. The brilliant beauty of what I just witnessed began to overwhelm me. By ordering the bridge to adjust the ship’s back-and-forth patrol by about 15°, he changed our course just enough to reposition the sun off his face. He literally just redirected thousands of tons of steel and hundreds of people so that he could get the sun out of his eyes while he ate his breakfast bagel. I was in awe. For a moment I was afraid his own genius may have escaped him, that he may not fully appreciate the epic brilliance of his laziness (since he wasn’t going to wake up for another hour). But between his next bites he paused, looked at me, and gave me the faintest sly grin before returning to gnaw slowly on his zombie bagel. Showing Off His … Youthful Vitality? Before his vegan days, Bill Clinton was known for a diet “heavy on meat, dessert at every meal and tiny amounts of vegetables, the tinier the better,” as the New York Times put it in a 1992 article. But two days after selecting Al Gore as his running mate in July that year, the Democratic presidential hopeful took his would-be veep on a jog aimed at showing the ticket’s youthful vitality—and ended up showing a little more than that. After the run, the pair stopped at a McDonald’s for drinks. It is the State which educates its citizens in civic virtue, gives them a consciousness of their mission, and welds them into unity.